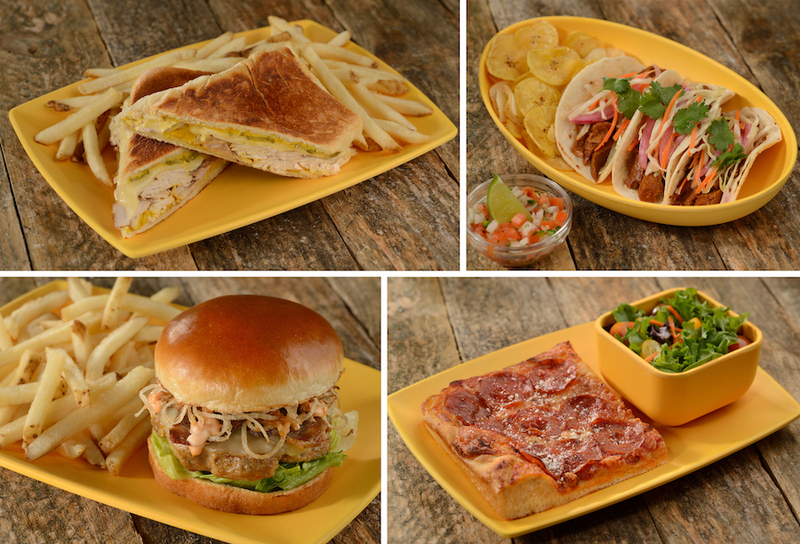 Disney has recently shared some exciting (and tasty) new details about the expansion of Centertown Market as well as a festive, pool-side bar called Banana Cabana at Disney’s Caribbean Beach Resort! First up is Centertown Market – this quick-service restaurant has been expanded and reimagined as an indoor street market. The new and inviting space includes open shutters, wooden light posts, awnings, and most importantly, delicious new eats. 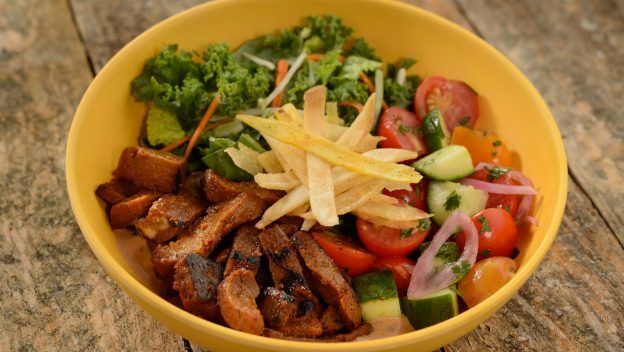 The new menu at Centertown Market will include a combination of family-friendly fast casual offerings mixed with customizable Latin and Caribbean-inspired dishes. 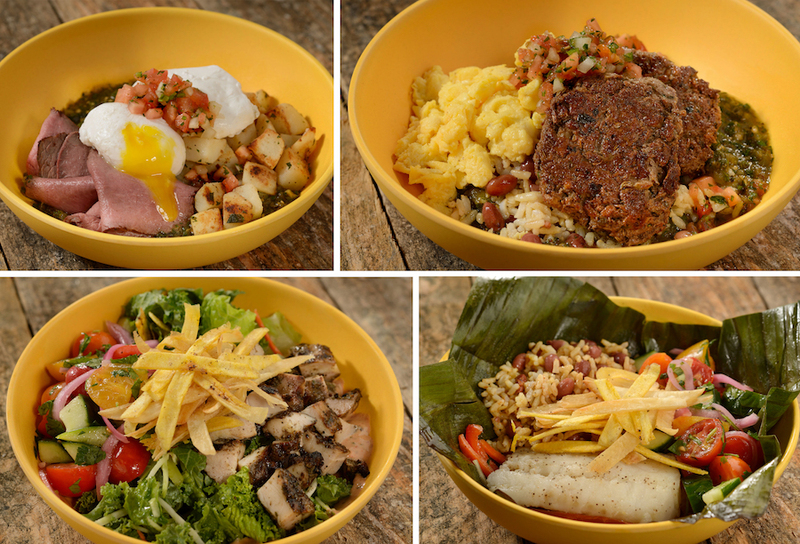 One of the highlights of the menu is the new Island Bowl available for breakfast and dinner. These bowls can be customized with your choice of base, protein, sauce, and if you’re ordering a breakfast bowl, you can even choose what kind of egg you want on top (scrambled, poached, or tofu scramble). Bases include red beans and rice (offered all day), home fries (for breakfast), and greens (for dinner). For proteins, choose between rotisserie beef, bacon, chorizo, or plant-based sausage for breakfast and rotisserie beef, pork shoulder, banana leaf-wrapped fish, jerk chicken thighs, or vegan chipotle seitan for dinner! Breakfast sauce options include salsa verde or pico de gallo, while the dinner sauces include chimichurri, garlic ranch, or spicy pink sauce. 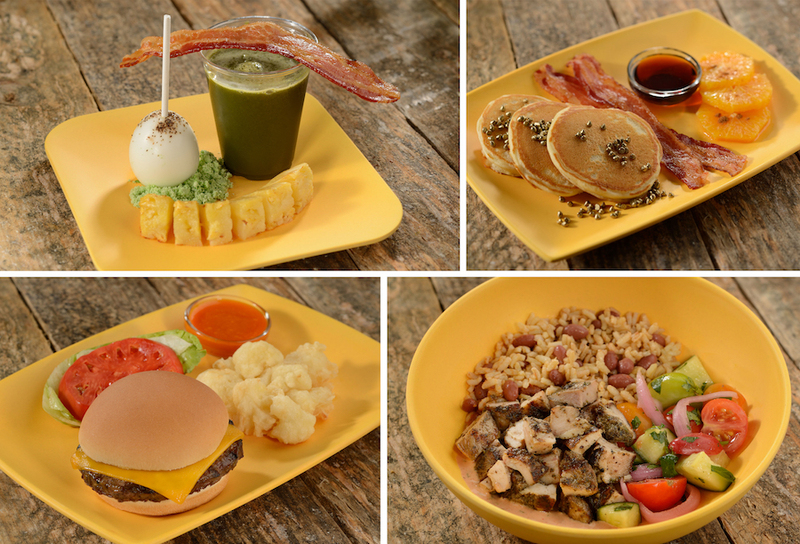 With all of these options, there are over 30 different combinations to choose from for both breakfast and dinner! 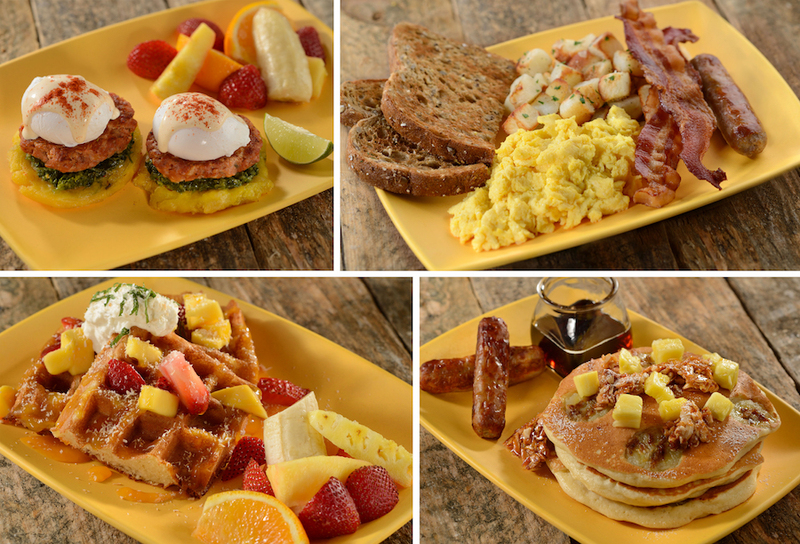 On the breakfast menu are classic dishes like Eggs Benedict or the All American Breakfast Platter with eggs, home fries, sausage, bacon, and toast as well as island-inspired creations like Coconut Waffles with fresh fruit or the Banana Pancakes topped with granola and pineapple chunks and served with sausage and maple syrup. If you’re craving something sweet, try the Tropical Tart with key lime, mango, and passion fruit curd with Chantilly or the Chocolate Crème Tart with chocolate cake, coffee Chantilly, and caramel crispies. There’s also a wonderful array of options for kids! They’ll enjoy some familiar favorites like Pirate Mickey Waffles and French Toast for breakfast and Chicken Breast Nuggets, Tacos, and Grilled Cheese for dinner. For the adventurous little sailors, our chefs created some unique new offerings like the Egg Popper for breakfast (a hard-boiled egg pop with green pirate juice, roasted pineapple, and bacon) and the Beef and Mushroom-blended Cheeseburger for dinner (with “cauli” fries, orange sauce, and a mini “build-your-own” Island Bowl). The expansive beverage island will offer fountain beverages featuring Coca-Cola® Freestyle, freshly-brewed coffee, and a variety of teas as well as draft beer and single-serve wine and cocktails. Or you can step inside the Grab ‘n Go Market, where you’ll find delightful specialty coffees and quick bites to-go. 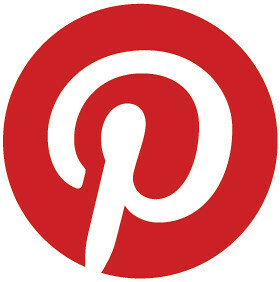 Now – let’s talk about the Banana Cabana! This pool-side bar will feature an outdoor lounge where your family can gather for some yummy food and refreshing alcoholic and non-alcoholic beverages. The lounge is inspired by the festive culture found in the Caribbean, mixing a relaxed sitting area with a lively bar. Cabana-style drapes flank the seating groups and re-purposed steel drums will illuminate a central communal table made from a wooden boat. 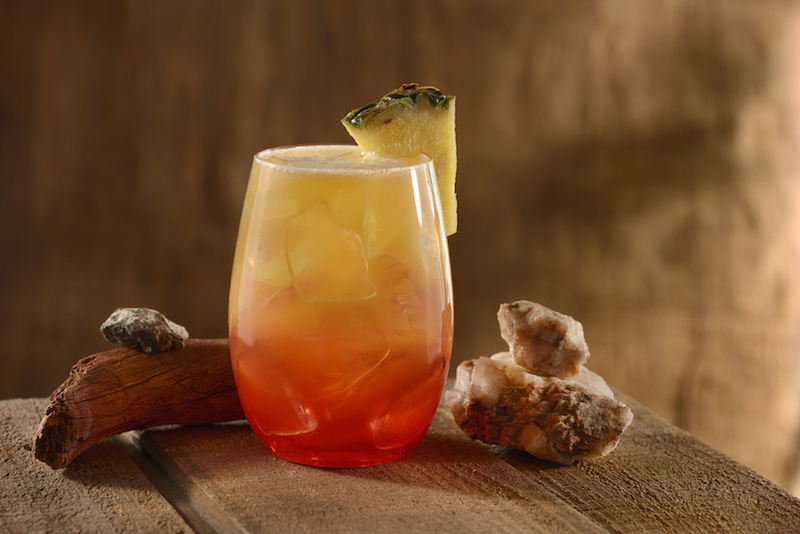 It’s always “island time” at Banana Cabana, and what better way to immerse yourself in those tropical vibes than with exclusive cocktails made with premium spirits and Caribbean seafood and mainland dishes. Delightfully-flavored libations include the Pink Guava Colada featuring rum, guava puree, pineapple juice, and cream of coconut and the Kraken Punch with spiced rum, blood orange sour, and pomegranate and orange juices. Caribbean beers will also be available for islanders along with a variety of craft and traditional beers and premium white and red wines on tap. For non-alcoholic options, adventures await you with drinks made with fruit juices and tropical flavors. One of these drinks is the Tropical Paradise, a fruity blend of pineapple coconut, cinnamon, and lime dusted with nutmeg. Centertown Market and Banana Cabana are set to open in late Fall of 2018 and are part of the greater reimagining of Disney’s Caribbean Beach Resort. 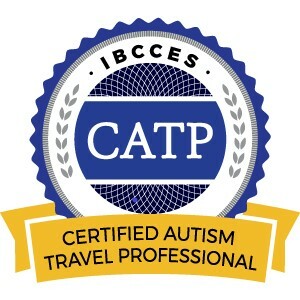 This entry was posted in Disney, Disney World, Florida, Orlando, United States, Walt Disney World Resort and tagged Banana Cabana, Centertown Market, Disney's Caribbean Beach Resort on September 28, 2018 by siera.